The machines hum in unison behind her. The pattern of her dress is uniform, small brown picket fences in front of orange suns, some squares, scenes from a marriage of conflicting color. Its 5:30 pm in an automat in Minneapolis as Elizabeth works on her second ice cream sundae. The year is 1967, Jackie Kennedy has yet to add an O to her name and the styles and modes of thinking that marked the 1950's still have a seat at the table. Elizabeth is tired after shopping and a long day at work and her groceries sit next to her. She is thinking about her Yorkshire Terrier named Gustave. Gustave is 9 years old and has hypoglycemia so Elizabeth likes to mix his chow with Special K twice a week to help his blood sugar levels. She is sitting at Horn’s, her favorite automat, eating ice cream and studying her TV Guide. After feeding Gustave, Elizabeth will relax by watching some of her favorite shows, pre-selected, starting with Peyton Place at 8, followed by I Dream of Jeannie and Hogan's Heroes. Elizabeth, or Betty as her friends like to call her, loves her shows, especially Peyton Place, even though Mia Farrow left the show last season and the writing just isn't on the high level of the first two. Betty knows that she will absolutely need the levity provided by Jeannie and Hogan following the emotions of Peyton. Betty has an affection for that sort of melodrama that Peyton Place exemplifies, melodrama that her coworker's at the file clerk's office just wouldn't understand. Even though everything is already pre-selected, including the song on the jukebox “How Much is that Doggie in the Window?”, something inside of her tells her that today will be different. She has a lotto ticket in the left pocket of her dress- it’s a winner and she can feel it- and she's wearing her lucky green socks today to mark the occasion. As she eats her ice cream she realizes that she is just so glad to be here at Horn’s, even though it’s a bit nostalgic at this point and everybody goes and eats at fast-food places now. There really aren’t many people in here today, Betty makes a mental note to herself. She likes the comfort of her favorite table where nobody can bother her, where she can watch the world go by, the buses especially, where she can sit and read about her favorite shows in peace. And as she swings her feet and eats her ice cream the world seems, briefly, smooth as the glass that holds those wonderful plates of confections. Betty knows that the Ho-Joe’s and trendy new fast-food places of the world can’t be this, and would be just plain nuisances at the end of a long day, hubs of distraction. She knows her thoughts should be fresh and ready, uninfluenced by the outside world, a fresh canvas for every thought that one could wonder, pulled without remorse from the canister of her own mind, an infinite number, or lying in wait on refrigerated Lazy Susan’s waiting to be consumed. Her aperitif, her prelude to a night of viewing pleasure, is sitting and eating her sundae (two today because today is special and she knows it) and watching the cross-town bus come in. She loves looking at the people crowd behind the door just before exiting the bus. Each person, each expression, every expectation, frustration, are in the folds of the faces that wait behind those small glass windows. She knows each character and looks forward to their grand exit. She sees herself in every person, especially Purple Hat, small dog, pearl necklace, the lady she hopes to be when she reaches that stately age. PSP is always the last off the bus, always in such a dignified, graceful manner, outside of time, a queen in a milieu of rushed supplicants. If anyone else in the world could know, if they could only turn around to see. There is another that she watches for: very bald, bent glasses, worn briefcase. VBW rushes and fumbles out like the exhaust of the bus, a bumbling, insignificant man, that reminds Betty of her ex-husband and his love of that terrible singer and all his terrible records, least she speak his name. But today is different. She waits and she waits but no Purple Hat, no show, the faces and the dance but no queen, no grand exit from the ball. She's holding her spoon aloft and the ice cream drips down. She's confused. She thinks to herself "did I miss her?". The bus pulls away. Dread comes over Betty. Beyond a cloud of exhaust, she spots a beaten four door across the street, a heavy black V8 helmed by a woman wearing large black sunglasses and smoking a cigarette from a long holder. She's in her mid to late 30's and part of a sect of people that Betty can only refer to as on the "fringe", "Fringies" as she calls them. They stare at each other for a moment. Betty is immediately reminded of her ex-husband Frank. Frank still drives the same route. When they were married, every day Monday through Friday for a period of about two years at almost exactly 7 pm, Frank would get home and put on the record from hell. Bettie gets angry just thinking about the name of it: Bringing it All Back Home. She makes an audible sound of disgust thinking about those words and the home that Frank walked away from. Frank would sing along with the record too, one nasally voice calling out for another like two dogs from neighborhoods away, when all Bettie wanted was a little peace after a long day. There was one particular song that Frank would always play louder than the others. The ice cream drips from the spoon unto the table as Betty says its opening line "She's got everything she needs". The woman gets out and Betty sees it on her left hand. Its an Egyptian ring. She starts to walk across the street, not really minding the rush hour traffic. She's carrying a bound book as if it is a knife. She's beautiful, dangerous, and awe-inspiring, all at the same time. She has long black hair that runs down the back of her knit sweater, hair that’s wild yet civilized, hair that could easily be persuaded into having a life apart from it's owner, a life beyond the law. Betty notices the name on the books and makes a mental note that it sounds foreign, Betty thinks, someone named Franz Kafka. Betty sees her walking and can’t help but think of an alien landing, something straight out of The Day the Earth Stood Still, with saucers traded for Buicks. The woman heads toward the automat still smoking her cigarette and Betty realizes that she is the only one sitting there. Dread comes over her. Betty lowers her hand down to feel for her purse, sensing she may have to make a quick escape if things go the way she thinks they will. “I had a dream last night and you were in it. There is a parable in this book called "Before the Law", about a man waiting his whole life for a gate to open only to learn that the gate was created for him and for him alone. I believe that some of us are created solely for the frustration of one other person. This was the basis of my dream and in it, I saw a picture of you sitting here. Before I go, I believe we should show a sign of goodwill. I will give you my book and I will take yours, this, the TV Guide. I will study it and look for answers. Thank you." Marisol takes her TV guide and leaves in the V8, heading, presumably, back to New York City. The idea for this piece came about after walking through the National Portrait Gallery and ruminating on two really fascinating pieces in themselves: Woman Eating by Duane Hanson and Marisol by Judith Shea. The personalities of the two works, the artists behind them, the larger picture of when and where they came about, made me wonder who these works spoke for and the possible story behind the small details of each piece. In the end, it was an obvious choice that the two should meet. Not only that, but that the two should meet in media res of the time and place that each work implicates. For some reason it had to be an automat and I know that sounds strange. 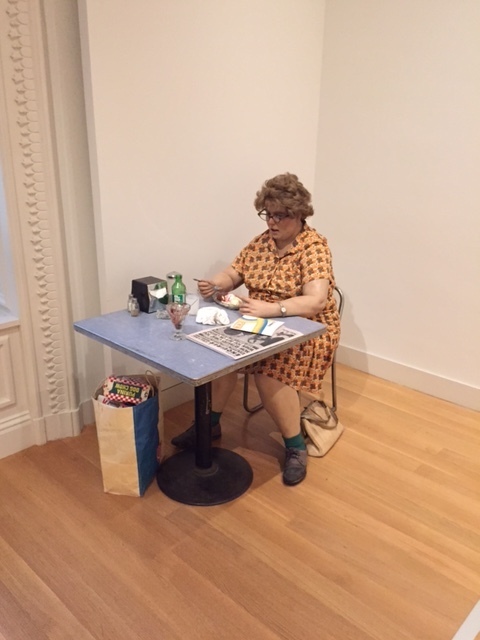 Maybe that’s an indication to why I can’t let go of the details like the napkin dispenser lying on the table of Duane Hanson’s work, the significance of the TV Guide in that same work, or the chisel that Judith Shea has her Marisol hold. Or perhaps, I’m making a very vain attempt to explain that this piece isn’t like the movie Night at the Museum. That, or I may just be a distant cousin, pardon the Seinfeld reference, to the man on the subway that steals Elaine’s TV Guide and turns it into a bouquet in the episode “The Cigar Store Indian”. Either way, I hope you enjoy.